This minor release focuses on improvements to Sprytile's paint mode. Most notably it enables previews for paint mode, making usage of the paint tool easier. It also fixes major bugs with paint mode that were initially obscured by only testing paint on quad faces, making Sprytile more robust for use with organic models. Also fixed in this release is the auto image reload functionality. I noticed during testing that it sometimes causes a race condition when reloading the image while it is being written in an external image editor, causing the texture to be buggy until Blender is restarted. 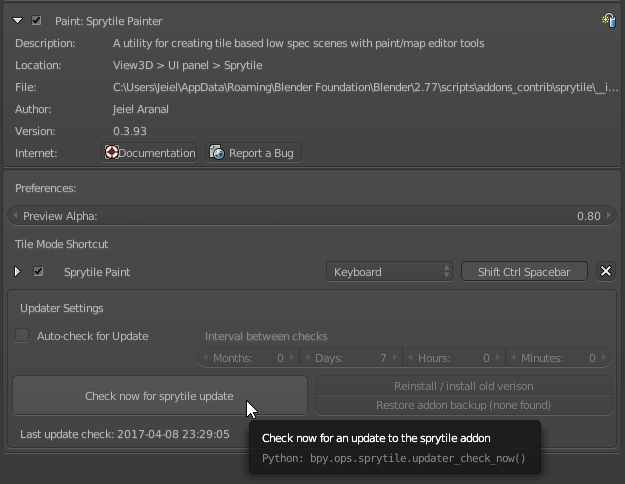 If you have a recent release installed, you should be able to download and install the latest version of Sprytile from within Blender. If the auto updater is not setup, open Sprytile's preferences to initiate the update. The next feature I'm planning on working on for the 0.4.0 release of Sprytile is Multi-tile Painting. If you're curious about the planned work for Sprytile, drop by the waffle.io board to see the current state of planning. With any luck, the next release won't be one month apart! Thanks to the following contributors for submitting issues and bugfixes that improved Sprytile! @not_surt, for opening issues that led to tool previews, the work plane display, and various UX improvements. @hikari_no_yume, for submitting a detailed bug report and subsequently taking the time to fix it.